A pet store is selling a lethal for $10. I normally wouldn't post anything from a pet store, but this is a special case. Boo, ten hours and a passport away :(. Wonder how his teeth are? If he is a year old, he is probably high functioning like Ed. Kermie, transport is not impossible -- at least I think Toronto to your area has been done before. Could you take him if a way was found to get him to you? Lana, are you near this store that you can check him out to look at his eyes and front teeth? I can contribute a little gas money for transport if it will help. The pet store is so far away from me (probably two and a half to three hours on public transit) I'll be coming home with him regardless. So I would need a firm commitment that someone is taking him and has a plan kind of in place regarding transport. Let me email the store to inquire more about him. That way we can confirm he is a lethal... and then we can try to set a plan in motion if need be. so, I emailed... he has misshapen eyes and one tooth... He's a lethal. He definitely has a home here if we can arrange a piggie train. I'm checking with a few people here to see if they're going to Buffalo in the near future. Just wanted to join in and say that I am currently in Toronto and am driving back home (to NJ) at the end of July and could bring him with me then. Unfortunately I would not be able to keep him with me before that, though. I don't know where you guys are located. 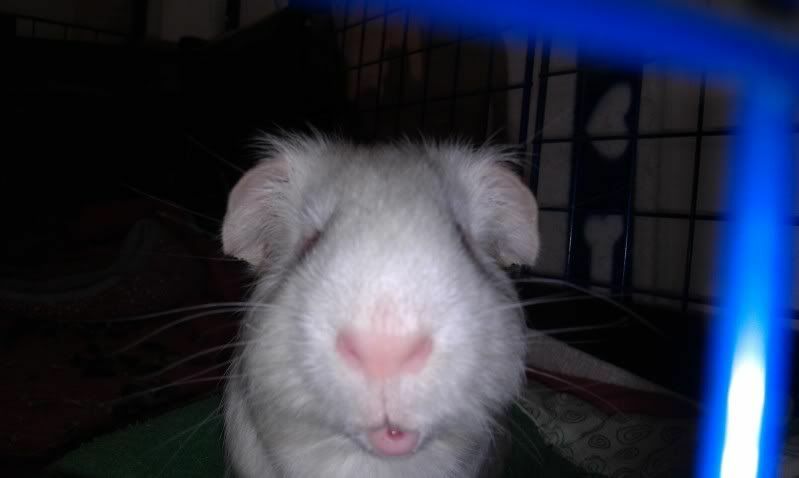 Seraphanjil, are you Marci's friend, who runs Have a Heart Guinea Pig rescue? Because if so, we are only about an hour away from each other. Not to put words in Seraph's mouth, but yes, she is! :) I was at both of their homes last night, so I know where they both live, but I can meet anywhere in NJ. Ech - Do you know of anyone in the area (Or Lana) who could pig sit him until then? (all food, supplies and possible medical would be my responsibility, and I can paypal or send a check for his $10 fee, and your transit commute). That's awesome! Marci pig sat my two girls last month, and she's going to watch Piggy again for me in August. 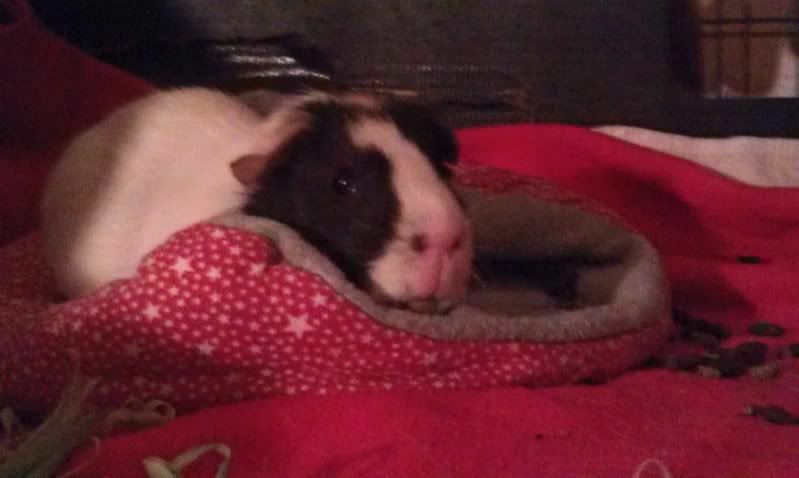 Unfortunately I don't really know anyone in Toronto (am spending a few months here with my dad but really I live in NJ and go to college in Philly), but I have briefly emailed with Caroline who runs Piggles Rescue and can ask her if she would be able to pig sit him or know anybody who would. Or else Lana would be great. I'll shoot Caroline an email and let you know what she says! I know Caroline is moving soon so I don't know if she can help. She's not taking any pigs at this time but I think if its temp she may do it. I wish I lived closer, being across the country unable to help makes me so sad for the little guy. I really hope she can help too, but I know moving can be a nightmare in and of itself. Lol just moving in and out of my dorm room every year is so stressful, and I'm just a student and don't even nearly have a full household of stuff or anything like that. Kermie - I know you emailed the pet store and have confirmed that he is a lethal, but I'm thinking of still dropping by sometime later this week just to check up on him and see what kind of conditions he is in. I will report back to you and can try to take a picture of him, if you'd like. It's just going to be so hard for me to leave him behind. I really wish I could just pig sit this little guy myself, but I'm staying with my dad in his apt and there's just no room to set up a second cage for him. I really hope we can find someone to pig sit him for the next 6 weeks or so. Really great news, Caroline just emailed me back! Lana had also contacted her about the piggie and she is looking through her network to see if she can get him to NJ earlier, but in principle she said that she could probably arrange for him to be looked after until I go back if need be. So either way it looks like he will be making his way to NJ, now maybe even sooner rather than later! So Caroline is willing to call the pet store and ask them to hold on to the piggy for the rescue so that she can pick him up next week, and she is also going to ask them to give the piggy to her because they never should have been selling him in the first place. She doesn't go on Guinea Lynx, but she wanted me to find out first if anyone has been in contact with the pet store, for example asking them to put him aside or doing any other sort of negotiations with them, so that she doesn't undermine any communications that have already been made. So, has anyone else talked to the pet store besides Kermie? I've told Caroline that I'll pay the $10 plus tax & pick up the pig if they refuse to give up the pig gratis to her. I hate to put $$ in their pockets (especially since they advertise that they sell live feeder rats), but I do want to save this pig. Caroline, for principle and legal-ish reasons, cannot pay for a pig. It would completely violate her relationship with the vets who provide care to the rescues, the funding she sometimes receives etc. Anyway, I am confident we'll have this pig in our hand this week and then can get him to NJ. Timon however, is getting a good nap in before the excitement begins. Thank you guys SO much for helping me, and this little man.